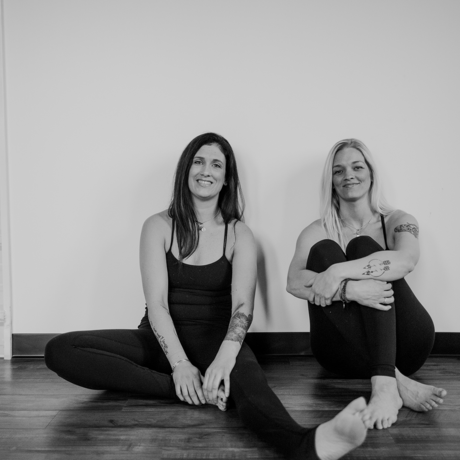 Ashley Yost and Mali Jane are co-owners of AM Yoga, a yoga and meditation studio on Grand Rapids’ West side. Ashley took her first yoga class 10 years ago and a clarity came from going back time and time again: yoga was unlocking the secrets of health and energy, and opening her up to possibilities for her life beyond what she imagined. In the past five years, Ashley has practiced yoga every day, creating space for her own learning and growth, and personally experiencing all of the benefits the practice of yoga has to offer. Since 2000, Mali has helped herself and thousands of others open up to the possibilities of health, connection, intuition, vitality, and freedom through holistic health practices. In 2011 Mali started practicing yoga and quickly saw how the practice of Asana, Pranayama, and Meditation were the highest form of personal holistic health care. From that point forward, she became a dedicated student of the yoga practice, committed to a daily practice, and devoted her time to creating a community, studio, and multiple programs through AM to share the practice of yoga. Ashley has taught since 2010 and is Baptiste-certifield, Mali began teaching full-time in 2013, and is LLT-certified, and both are E-RYT200 with over 1,500 hours logged. Their mission is to continue to grow AM for others to have access to yoga that is accessible, relatable, and experience real results in their lives. She has taught thousands of people how to be happier and healthier utilizing yoga. A cornerstone to her being is living her practice and sharing how people can cultivate a daily practice to learn skills and tools to create their life. The daily practice was the inspiration behind the popular 365 Program designed to support and build a community of daily practitioners through live yoga classes and podcasts, giving others access to a daily practice. As co-creators and leaders of teAM, a corporate wellness program that uses yoga, breathing techniques and guided meditations to help employees boost their productivity, increase retention rates, open creative energy, and allow people to trust their intuition to make better decisions has been changing workplace culture for the past 2 years. Ashley and Mali are experts in helping others connect to themselves, which allows full connection to others leaving space for people to move into living a life that is great.